You can quickly print or email a customized checklist to yourself or someone you love by selecting the sections that matter to you below. Or skip past this area to see all of the steps included in each section. Don’t see a form? Click here to get the full experience. Success! 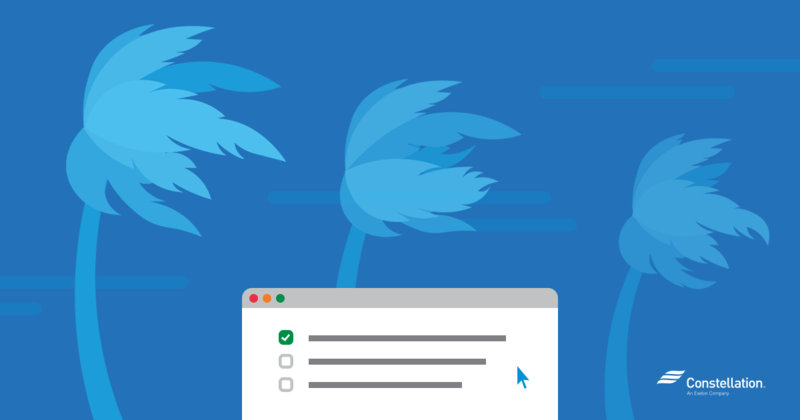 Check your inbox for your personalized hurricane checklist. Sorry, your submission has failed. Please try again. Take photo inventory of your belongings. Take photos of your belongings in case they’re damaged by water or wind from the hurricane. These photos will come in handy if you need to file a claim with FEMA or your insurance provider after the hurricane. Empty your fridge and freezer. If your power goes out during a hurricane, which is likely if your area is in a floodplain or is under mandatory evacuation, your fridge and freezer will thaw without power. Either dispose of any perishable foods or wait until after the hurricane to determine if they’re salvageable. Tip: Use the quarter test! Fill a cup of water and freeze it. Before you leave your home, place a quarter on top of the ice. When you get back, you can see if your freezer thawed and re-froze by checking if the quarter melted into the ice. Turning off your electricity at the main breaker can prevent surges through floodwater around your home. Do not turn off your natural gas at the meter. Learn more about hurricane safety tips for electricity and natural gas. If you decide to leave all of your utilities on, be sure to turn off as many electrical devices in your home as possible. Clear the area surrounding your home. Clear all lawn chairs, decorations, children’s toys and other movable objects by either tying them down or moving them inside your home or garage. Check your trees for potential risks. Circle the outside of your home and look for any weak or broken limbs. Cut the weak or dead branches off of your trees to ensure that they don’t become flying debris, which can cause major damage during a hurricane. Board up your windows and close storm shutters. Depending on your situation and resources, there are a number of ways to protect your windows from a hurricane. If you have hurricane essentials like storm shutters, close them. If you have access to sheets of plywood, board up your windows tightly to prevent flying debris from shattering them. Tip: If none of these options are available to you, try taping up your windows, but only do this if you are evacuating! It creates bigger shards of glass that can be dangerous if you are inside, but is easier to clean up once you return home. Check your home for leaks. If you have a ceiling or roof leak, now’s the time to seal it up because it may become much worse during the hurricane. Ready.gov suggests having enough water on hand for three days, allowing 1 gallon per day, per person. Buy or stock nonperishable food. Canned foods are great hurricane essentials (don’t forget a manual can opener — not electric! ), or if you’re a serious survivalist, military MREs. Prepare your first aid kit. Double-check that your first-aid kit is fully stocked with the essentials — reference the Red Cross’s emergency first-aid kit list for suggestions. Keep your phone charged with a portable travel charger in order to make emergency calls, just in case the power goes out. Pack, as well as photocopy, important documents such as your marriage license, social security card, copy of children’s vaccination records, insurance information, etc. Write out your emergency phone numbers. Write out a list of all emergency contact numbers, including both your family’s numbers, utility provider’s numbers, school or work numbers, and public helplines. Have a crank or battery powered flashlight and radio on hand. Either works just fine for its purposes, but if your flashlight or radio is battery-powered, pick up plenty of extra batteries! Know when you need to get out. Knowing the difference between a flood advisory, flood watch, and a flood warning can keep you and your family safe. If your area is under a hurricane flood advisory, be aware and evacuate if needed. If you are under a flood watch, be prepared for the potential of flooding. If there is a flood warning, take action and move immediately to higher ground if possible. Pack your medicine -- try to plan for extra doses! Always remember to pack critical medication for every member of your family (including the dog!). Medical emergencies after hurricanes are often due to a disruption in prescription refills. You can find an up-to-date list of local pharmacies that are open during a hurricane by checking HealthCareReady.org. Fill up your gas tank in your vehicle(s). Fill your gas tank, and keep it full. Don’t do this the day of evacuation because gas stations will be busy and may be running low. Every minute counts when it comes to getting on the road. Set out an evacuation route for you and your family, as well as a back-up route. Be aware of bridge closings if you live on an island or peninsula town. To prepare for internet outages complicating GPS availability, purchase paper maps to add to your hurricane supply list. If you need to evacuate but do not have an available place to stay, the Red Cross and Salvation Army offer shelters for those affected by natural disasters. Research to see if your area has any local shelters set up. Federal Emergency Management Agency, or FEMA, can give you temporary shelter. You can contact FEMA and request shelter by texting SHELTER followed by your zip code (example: shelter12345) to 43362. FEMA also provides housing assistance for those who have lost their homes in a natural disaster, such as a hurricane. Visit cancellations.com for up-to-date school closing notifications. If your town isn’t under a mandatory hurricane evacuation but your family decides to evacuate, notify your teachers ahead of time. This will give you an excused absence, and let your teacher know you’re safe. Stay up to date on assignments. Use your extra time waiting out the storm to work on any major school assignments you might be missing. Send an email to your supervisor(s). Be proactive and let your boss know as soon as possible if you’ll be evacuating or not. Set up an automatic email responder if you will be out of the office for a long period of time. Include your contact information and be clear about when you will return. See if your pay is covered. Some employers give paid time off (PTO) for disasters such as hurricanes. Check to see what your PTO policy is, and plan your finances accordingly. Check if your employer has planned evacuation. If you’re in an area that does not have a mandatory hurricane evacuation, your workplace may choose to weather through the storm. If winds get too severe or flash flooding occurs, make sure that your employer has an evacuation plan for all employees. If you need a specific device or item that can allow you to work remotely, take it with you: laptops, tablets, supplies, etc. For nurses/first responders: Make sure your family is safe, and they know you’re safe. The courageous workers who stay behind to aid the sick, injured or those in an emergency are some of our nation’s greatest heroes. If you’re one who has to stay behind for your job, be sure to clearly communicate with your family where they will be, and let them know exactly where you will be, what time your shifts run, and how to contact you in case of emergency. Know state requirements for small businesses during a hurricane or natural disaster. Businesses are required by law to offer a safe and healthful place in which to work, and for it to meet specific building codes. To learn more about what every worksite should have in place to protect workers from potential hazards, read about the Four-point Safety and Health Program. Create a business safety emergency plan. When it comes to hurricanes and other disasters, small businesses are encouraged to plan ahead of time for safety, protection, recovery or continuity of business. To learn more about hurricane essentials for small businesses, you can read the Disaster Preparedness and Recovery Plan by the Small Business Administration. Talk to your team as soon as possible, and go over your emergency plan to ensure their safety and the protection of business property and important documents. Define a communications plan, and let your employees know who to call, where to check or if there is an alternate location to do business. Make it clear to your employees if you still intend to stay in business and continue to serve customers. Communicate with clients and customers. Use your company’s social media channels to let customers know of any changes in store hours or closings. Schedule and arrange payroll ahead of time, while banks are still operating. There may be disruption of service during a hurricane. Make sure to backup your computers and save important data to the cloud or flash drives. If you have important papers, the U.S. Small Business Administration recommends gathering them, putting them in a three-ring binder with pockets in a waterproof bag you take with you. Arrange to store company vehicles in a place that is safer or on higher ground. Bring any possible outside hazards like signs and display racks inside or secure items that can’t be brought inside. Check your small business insurance policies. Make sure you understand what your business insurance covers, if your coverage is appropriate and you have all of your policy information in a safe place. If you don’t have flood insurance for your business and want to make sure your small business is safe from a hurricane, you can contact NFIP Referral Call center at (888) 379-9531 or visit disasterloan.sba.gov/ela/. Double check your marine insurance policy to ensure that you will be covered for any hurricane damage to your boat. Some marinas mandate boat removal upon hurricanes. Contact your marina for their hurricane policies. If moving your boat, determine the best placement. Find a safe place to store your boat inland, and be sure to weigh down the trailer or structure keeping it up. If keeping your boat docked, tie extra lines. In addition to extra lines giving extra strength, be sure to give extra length. This makes certain that any large waves or high waters allow the boat to rise and lower with it. Tip: For extra information on hurricane boat safety, check out BoatSafe’s Hurricane Preparedness Checklist. Don’t forget the diapers! Babies go through an average of about 8-10 diapers a day, according to New-Kids Center, so plan accordingly. Kids can get bored pretty quickly while waiting out a storm. Pack games and puzzles that do not require electricity so they can be used at any time. Prepare formula, food or your breast pump. However your baby eats, make sure you are ready with all the necessary hurricane essentials, ingredients, or tools needed to keep your baby happy and fed. If you are pregnant or nursing, be sure to pack extra fluids prenatal vitamins, other medications, and protein bars for yourself. Prepare to carry children in worst case scenarios. If you have infants or toddlers, be sure to pack a sling, baby carrier, or other carrying device in case you need to travel distances by foot. Tip:For more information on what to have in your babies and kids emergency supplies kit, go to the APHA's Get Ready campaign. Take pets to a kennel or friend’s place on high ground, or choose a designated caregiver or pet sitter. Remember, some public shelters do not allow pets. Experts at the ASPCA say to have 3-7 days worth of food prepped upon evacuation. Make sure your pet is wearing its collar and ID tags. If you are going to a hotel or facility that accepts pets, remember to have a travel bag and leash. Chip your pets if there’s time. The ASPCA recommends microchipping your pet so it can be identified easier if placed in shelters. Don’t wait until a hurricane to prepare an emergency evacuation evacuation plan for an elderly or disabled loved one. If they are with a caregiver, communicate and plan what should happen during and after the hurricane. If your loved one is staying at their caregiving residence, make sure you provide updated contact information for you and them. Make sure that their residence has all of the hurricane essentials needed to ride out a hurricane and be aware of their evacuation plan. Sensory toys and comfort blankets. Hurricanes can be scary for individuals with sensory disorders like autism. Remember to pack any sensory toys, games or weighted blankets than can help ease them during and after the hurricane. Pack medications and medical devices. Prepare oxygen tanks, speech machines, medications, and other necessities for instant evacuation. Switch manual checks to electronic deposit. Elderly citizens that get government benefits can switch from checks to electronic deposit by calling (800) 333-1795 or at www.godirect.org/. Prepare for a hurricane and be safe! While all of the hurricane preparations above will help you stay safe, provisioned, and prepared for the worst, the most important part of hurricane preparedness is getting somewhere safe before it’s too late. If you have the means and ability to, evacuate. Getting somewhere safe is critical, especially if you live in a flood zone. City resource: The City of Atlanta has information on flood insurance, ordinances and a map for residents. County resource: Fulton County has an interactive map of floodplains. State resource: The Georgia Department of Natural Resources also has a map of floodplains in the state. We hope that this hurricane checklist generator can help you and your loved ones prepare for the hurricane season.